This Torte that really isn’t a torte at all. Being somewhat of an easy treat to throw together, it’s been in heavy rotation every since I can remember. After church…. 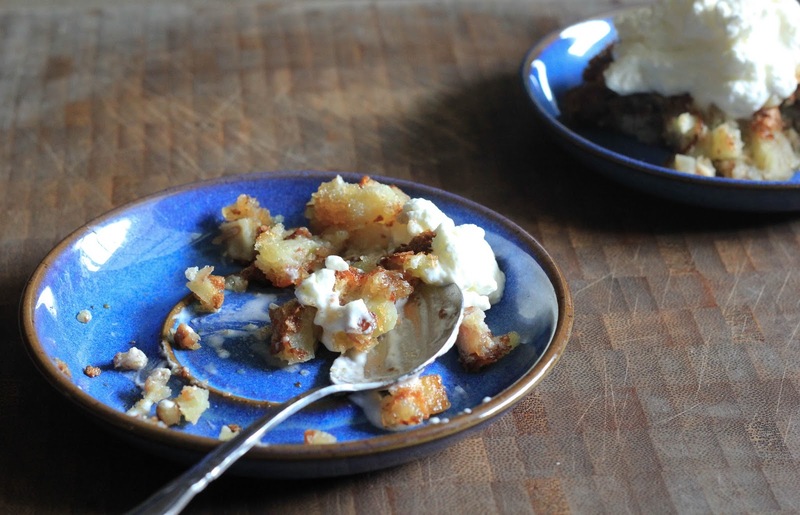 you would find this gooey, crusty apple nut decadence in a dish. Sitting in the middle of any Sunday Dinner table beside the fried chicken. 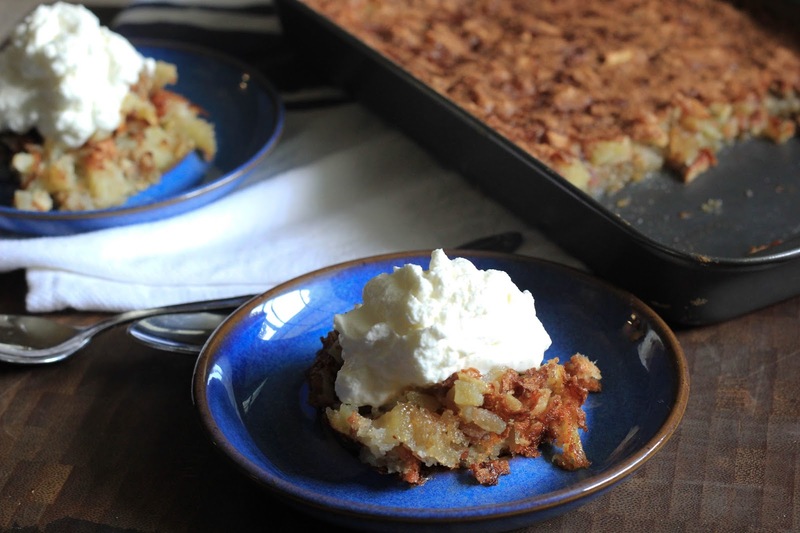 It originated out of Charleston, South Carolina, adapted from what some folks call Ozark pudding. Although the history behind it differs greatly depending upon who you ask. My grandma told me a tale of a French family on the high seas bringing this recipe to the shores of Charleston. It was captivating and exciting. It was also embellished with people with names like Grady and some lady with a purple suitcase. But it served the purpose.. by keeping her 5 year old granddaughter from going outside and getting dirty before Sunday school. Lord knows, she told the best stories. It’s funny that can remember each one down to what she was wearing when she told it. But couldn’t tell you what color underwear I'm wearing..not that you’d wanna know..cause that would be weird..
See how easily I get of track. 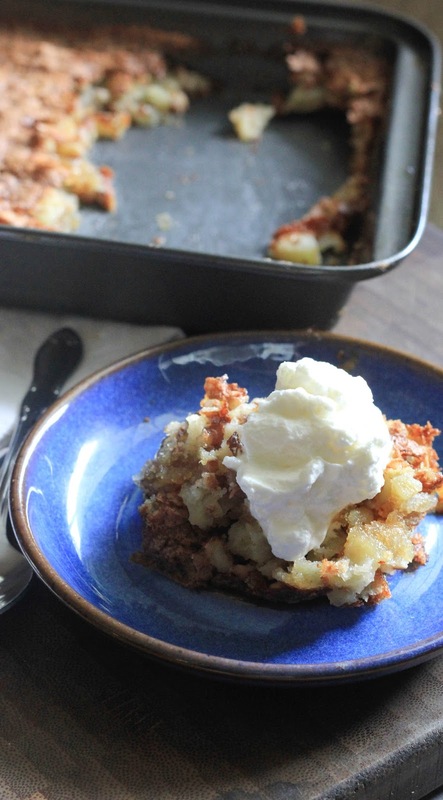 The Huguenot Torte is an icon of Charleston home cooking.. A southern confection that you can easily master at home with a few apples, pecans, flour and sugar. And 2 little blue plates... that are all that is left out of a box of your favorite dishes... that someone dropped while moving. Adapted this from my grandma's hand written notes. Using a stand mixer, beat eggs until creamy and frothy. Add in sugar, flour, baking powder, apples, pecans and vanilla, mixing after each addition. Pour batter into a well greased baking pan about 8x12 or 9x9 inches or at least 2 inches deep and bake for 30-35 mins. Until the top of the torte is crusty. While torte is cooking, prepare the whipped cream by whipping the cream with the buttermilk until stiff peaks form. Serve warm with a dollop of whipped cream over each individual portion. It will be lumpy pieces of crust, misshapen, gooey mess on a plate. But that’s all good and means your journey into the world of Huguenot Torte making was a success.